Aquatic physical therapy is a quantum leap forward in rehabilitation. It is administered in a specially designed, technologically advanced pool. Aquatic physical therapy complements traditional, land-based physical therapy programs. Treatment is provided by licensed physical therapists and physical therapy assistants who are trained in aquatic therapy. Often after an injury or surgery, a patient‘s sensitivity to pain is increased while weight bearing is limited, which restricts his or her activities on land. In water the effects of gravity are reduced and functional activity and motion can occur. The properties of water let a patient exercise in a relative “low or no impact” environment that provides more comfortable movement and enhanced range of motion. Water supports the body, reduces joint stress, and provides resistance and assistance to movement in a truly unique manner. Patients can rapidly improve mobility, strength, and function during the healing process. Why does Aquatic Physical Therapy Work? The pool’s high performance features represent the cooperative efforts of clinicians, engineers and visionaries. The revolutionary piece of therapeutic equipment features an integrated hydraulic underwater treadmill, massage jets, and an underwater monitoring system. With the use of an underwater camera, both the patient and therapist can observe and correct movement patterns. An integrated variable speed treadmill that smoothly increases speed from 0 to 6 mph. Pool dimensions: 11’ X 7’. Two different water depths: 47” & 51”. The pool is adequately sized to allow patients room to move. Fully automated water temperature that is easily adjusted for treating a wide spectrum of conditions. 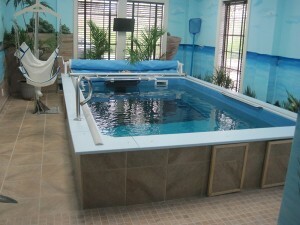 The temperature of the pool is maintained at 94 degrees, which is conductive to relaxation and optimal muscle movement. How can you take the plunge into aquatic physical therapy? A physician’s referral is required to participate in aquatic physical therapy. Each aquatic therapy session is individually designed to meet the patient’s needs and utilizes different equipment, depending upon the nature of the condition. A pool session may last from 15 to 45 minutes. Patients do not have to know how to swim to participate in aquatic physical therapy. Patients work with their therapist and are never left unattended while in the pool. Treatment may include a warm up, which may be followed by balance and stabilization exercises, strengthening, gait training, and endurance exercises. In-pool treatment may include the use of an underwater treadmill, in-pool steps, weights, a Thera-band, paddles, noodles, a balance and stabilization board, hydrotone boots, and hydrotone bells.